Here’s another High Voltage Yellow Rose. Check out my previous High Voltage Rose Flower posted earlier this month. This is a very beautiful flower that I’m afraid my image here may not do it quite the justice it deserves? It’s a very deep yellow color and white highlights. I thinks it’s also called a Yellow Submarine? 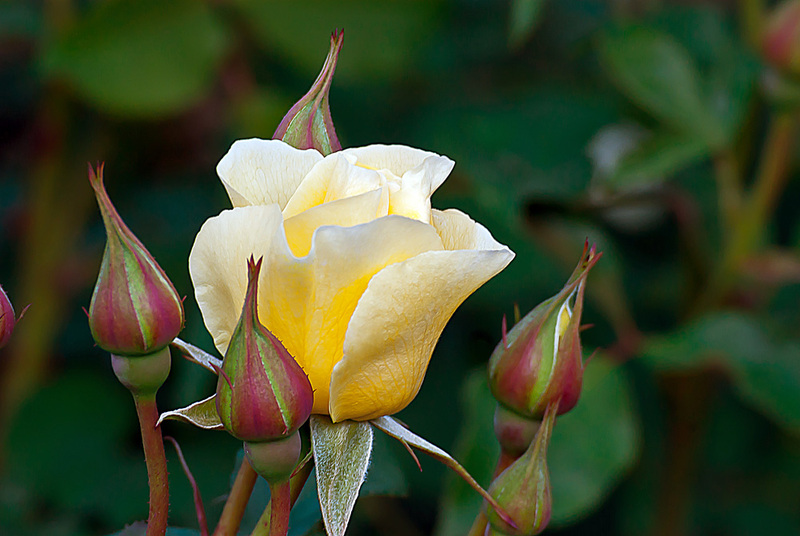 In this post we feature one blooming rose bud and 5 buds just coming to light. Hope you like? Please remember to share. I’m wondering if you could give me some advice on my blog – http://theradiantcherie.com/ since I’m trying to expand it. Thank you! I’m not sure I’m the right person to be giving feedback on blogs? I’m still kind of new to this blog thing myself. While I’ve been blogging for 3 years, I can’t seem to attract very many visitors to my blog. My blog is really pretty much just for myself anyway. Not sure my photography is very attractive to other folks? So, I don’t know if the feedback I would have to give would be valuable? I will point you in the direction of the Community Pool sponsored by WordPress – https://dailypost.wordpress.com/2015/06/22/community-pool-120/ if you link regularly to this blog, you’ll get lots of valuable feedback.